Every interpersonal relationship requires work and maintenance, especially romantic relationships. Whether it’s a long term dating relationship, a long lasting engagement, or a marriage, all couples eventually experience problems they need to address together. It’s the way two people go about addressing those problems that makes a couple stronger or weaker. 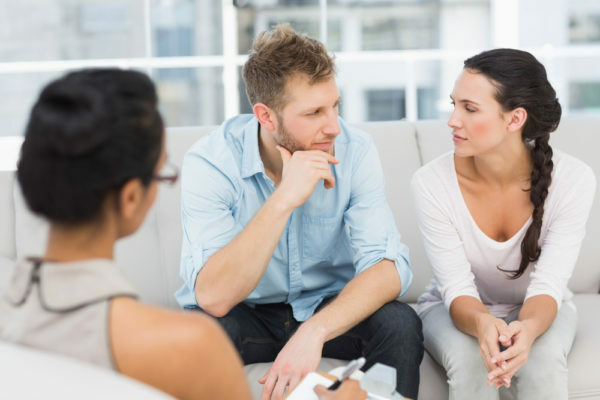 When couples and married partners experience problems they can no longer solve independently, it can be beneficial to the relationship to seek couples or marriage counseling. I specialize in helping married couples identify their issues, improve communication skills, and develop empathy for one another so they may work toward a happier, healthier relationship and marriage. Couples and marriage counseling helps couples of all types recognize and resolve their conflicts. I help couples make thoughtful decisions that work toward rebuilding their relationships or, in some instances, toward deciding to go their separate ways. Counseling is nearly always beneficial to couples who are having problems because it allows partners to address and attempt to resolve their conflicts in a peaceful and non-judgmental environment. As a neutral third party, I work with both partners, and in some cases one partner, in a way unique to their individual situation and needs. Every couple is different and some couples require more work and effort than others, depending on the severity of the conflicts and their willingness to open up and try to resolve the issues. Who says both people have to be in couples therapy? Marriage counseling and couples coaching can have many benefits even when only one person from the relationship is present in the counseling session. I can counsel one person who wants help and try to get their partner in for a session later. Fortunately, it only takes one person to seek help in order to change an entire relationship. Small changes in communication and emotional awareness can go a long way. It may take more time, but those small changes can eventually have a positive impact on your relationship. Couples and marriage counseling can seem like a scary step to take, which is why many couples put it off until the conflicts have severely weakened the relationship. Seeking marriage counseling doesn’t mean that a person wants to change their partner, it doesn’t mean it’s the end of the relationship, and it doesn’t mean that either person has failed in any way. Like a sickness, the earlier you can address conflicts and issues in a relationship, the more likely you and your partner will be to keep your relationship healthy. Divorce is always difficult, but it can be the best decision for two people whose goals aren’t compatible. That’s a decision that they come to, not one that I ever make for them, just as I don’t decide that they should stay together. I help them explore the issues and think realistically, and they make their own decisions. I provide my clients with the best counseling possible and can work with clients no matter what condition their marriage might currently be in. I can assess the current state of your relationship and offer my professional opinion on the best way to approach and resolve conflicts in your relationship. If you’d like to learn more, reach out to me here. I look forward to speaking with you. My husband and I have been having some minor issues lately, and I am curious to know whether or not we would benefit from going to marriage counseling. I like how you pointed out that this might help us be able to address and hopefully resolve any conflicts that we have came up. It would be great to be able to work these in a peaceful manner, which maybe will lead to us still getting to be together. My brother and his wife have a difficult time communicating. I have recommended counseling to him. I’m going to share this post with him. This might help convince him to give counseling a try. I thought it was strange that people went to couple’s therapy over parenting disagreements, though it does make sense. My friend is very young and getting married, so I think she may like to learn more about couple’s therapy. I’ll bring it up with her, so she can know what to do if she needs help. Thanks for the information on the benefits of having couples therapy. I agree that one of the biggest benefits of getting counseling is that there is a third party that is unbiased. I would imagine that some relationships and families need to have an outsiders opinion to get things straight. My sister recently got married and she and her husband are having a difficult time adjusting to married life, so they are thinking about getting marriage counseling. You make a great point that a counselor would be able to help them first recognize their conflict and get to the root of the problem. I think that this is important because this way my sister and her husband can figure out the best way to resolve their issues in a calm and non-judgemental environment with the counselor.